Nothing lasts forever. Nothing is ever finished, Nothing is perfect. I’m very aware of how nothing lasts. I seem to be spending a lot of my time these days in repairing and replacing things that I’ve done before, now I’m doing them again. The only trouble is that it’s so long since I did it last time that I can’t always remember how I did it and I have to re-learn or re-invent what I once knew and have since forgotten. Use it or loose it they say. I’m learning all over again how true that is. When I built my current pottery workshop in 1883 after the old one was burnt down in a fire, I was shown how to make beautiful corners in the galvanised iron guttering by the local plumber. He was a good man, very careful and caring. He took me under his wing as it were and was prepared to spend a bit of time on me. I worked for him as a labourer when I first came here in 1975/6. I had no income, until I could build a pottery and kiln. He gave me occasional work when he needed help on larger jobs. He was already 60 at this time and I was just 23. He saw some potential in me and mentored me. So when our work shop burnt down he offered to help in the way that he could by showing me the tricks of the trade of old fashioned roof plumbing, flashing and guttering. That was 30 years ago now and all that old guttering is worn out, repeatedly patched and repaired, now rusted through and has stopped catching the rain water that we need to exist here in the bush. It’s a big building and I need to do all of it. It’s 60 metres all around and I have to stretch my memory back to remember what we did back then. As I take the old corners apart carefully, It all starts to come back to me. Joe never bought any pre-fabbed parts like corners or stop ends. He fabricated everything from the full lengths of gutting sections as needed. It was very impressive to see him cut and fold the guttering section, bend them and make everything fit together into a perfect 90o corner with all the correct overlaps and reinforcing gussets, all just sliding into place. Little tabs sticking out in just the right places to allow secure reinforcing of the joints, just exactly where they needed to be. All this done free hand, without any measurements or marking out. He’d done it so many times during his life, he could do it in his sleep. He was a true master of his trade. I was so impressed watching him work. After a while of working with him, I could see the patterns in his methods, the sequences that were involved. At one point I could see the next step that was coming and had the right tool ready, so that before Joe could ask for it, I slid the tool forward into his hand at just the right moment before the words left his lips. He turned around and just gave a glance back at me. A small smile. Said nothing, and kept on working. That was all that was needed. We worked well together from that moment on. I’m struggling to remember all the little subtleties in the making of a gutter corner in the middle of a long run of gutter section. The lengths are 6 metres long and a little bit unwieldy up on a ladder by yourself in the wind. I measure from the last joint, allow an over-lap of 250mm. for a slip joint and cut my long section half way through with the tin snips. I make what I think is the right shapes and fold it around. It is almost right, but not quite. The next one will be better. I manage to man-handle the huge unwieldy ‘L’ shaped thing up the ladder and rest it on the roof. It takes some effort to slide it into it’s final position. Joe made it look so easy. I have to do it a little different from last time because in 1983 all the joints were soldered into place. These days it’s all silicon. I didn’t like the idea of having lead solder in my gutters catching drinking water, but even less keen on silicon rubber and plastic down pipes sealed with acetone. I spend two days doing all this work and now the roof is resealed and catching drinking water again. I’m sore and tired, having used all sorts of muscles that I don’t usually use doing all that ladder work. Janine’s nephew calls in for a visit and is very polite about my roof work. He’s a builder and tells me that no-one makes so much effort in their joints these days. What I’ve done is so old fashioned. He also lets slip that it cost $100 per metre for gutting these days. I’ve just saved myself $6,000 of money that I didn’t have to earn to pay a plumber to do all that work. It’s cost me about $700 in parts. So I suddenly feel a lot better. I like these aches and pains. Now it’s the lawn mower, the lawn mower that has given us such reliable service for the past 22 years is suddenly all wobbly in the steering. I check it out and find that the front axle is actually made of pressed metal and has fatigued away and started to split and tear in half on one side. A closer inspection reveals that the other side has splits and cracks in it as well. I decide that I will have a go at making a new one to replace it. One of the first mowers that we had was an old ride-on mower that we were given for $50 by neighbours who decided to sell it when they sold their house to move into a smaller place in another village. They wouldn’t need it on the smaller block. The local mower shop had offered them only $50 for it, but only if they delivered it to them. They asked me to deliver it for them, as I had a trailer which would fit it. I asked them why they would accept only $50 for a valuable ride-on mower? They told me that they had previously been Sir Russell Drysdale’s caretakers up on the Central Coast. He was a very famous Australian painter. He had bought the ride-on for them to use to mow his lawns. When they left to come here 7 years later. He gave it to them and said that as Ron was the only person who could start it and keep it running properly, he should keep it and Sir Russell would get a new one for the new caretaker. Now 7 years later, they are down-sizing and moving onto a small suburban block. Ron said that as he hadn’t paid anything for it. It was unethical for him to profit from his former boss’s generosity! I said that I would be prepared to pay him the $50 and just deliver it to my home and keep it to use myself, as we had 4 acres and didn’t have a working mower. He was thrilled that it would go to a good home directly and to someone that he knew and liked. So we got a 15 year old adolescent, difficult, temperamental, fickle, changeable, unreliable and often intermittent working mower. I don’t know if it was true that only Ron could work it reliably every-time. I doubt it. The problem was that the old Briggs engine was ‘cooked,’ It blew clouds of smoke out the exhaust and took a lot of pulls on the cord before it would begin to ‘kick,’ and then only weakly. Once it did start, it only had enough power to run on the level. It had enough power to actually ‘mow’ while it was going down hill, but it didn’t have enough power to actually carry my trifling weight up hill and mow at the same time, so I could get off and push it up hill while it mowed, or stay on and turn off the mower function so that it could cary me up hill, where I could re-engage the mower and mow another down hill strip, etc. After a couple of years of this it couldn’t mow and carry my weight at the same time, even down hill! Something had to be done. I looked around and finally found a Honda motor that would suit the fittings on this old mower and wasn’t too expensive. The sales man said that it was identical to the old Briggs motor. 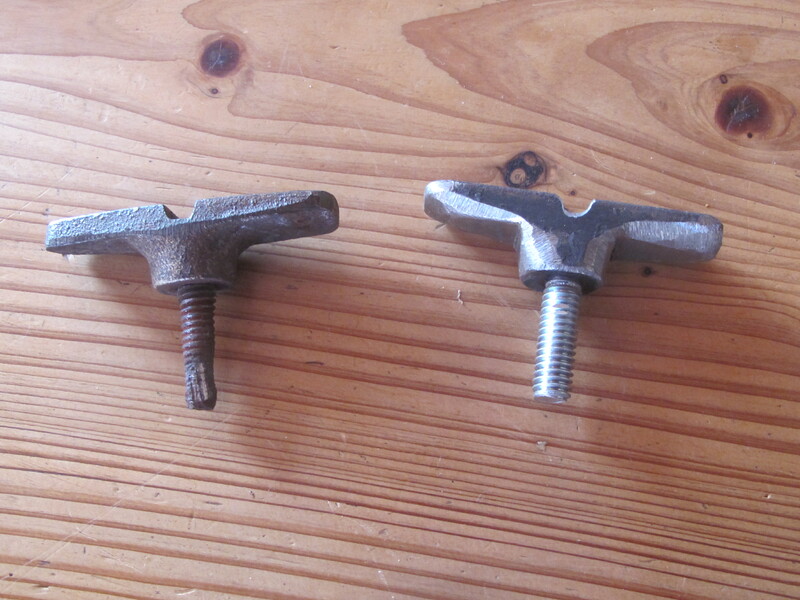 Same mounting bolt diameter and spacing, same shaft size. So I bought it. What he didn’t tell me was that it was an overhead valve motor, while the Briggs was a side valve. This made the new motor 100mm wider. 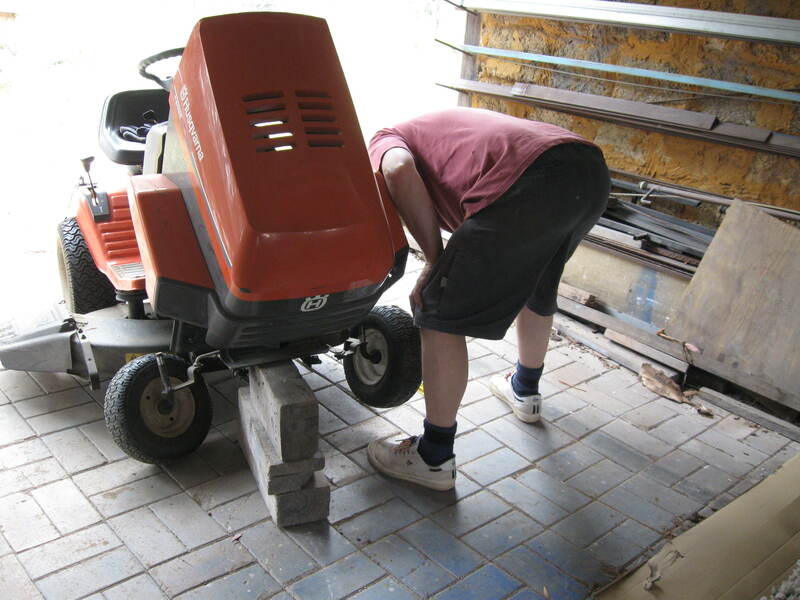 I had to cut the mower in half and add 100mm. to the length of the chassis and weld it back together again, just to allow the extra space for the longer motor to fit into its housing. I was the most surprised of all. You know, that mower might have belonged to the famous artist, Sir Russell Drysdale, but the paint job wasn’t that good — and he never signed it! I wonder if it was a forgery? Anyway, I eventually gave that mower to a friend, and we bought the new one. 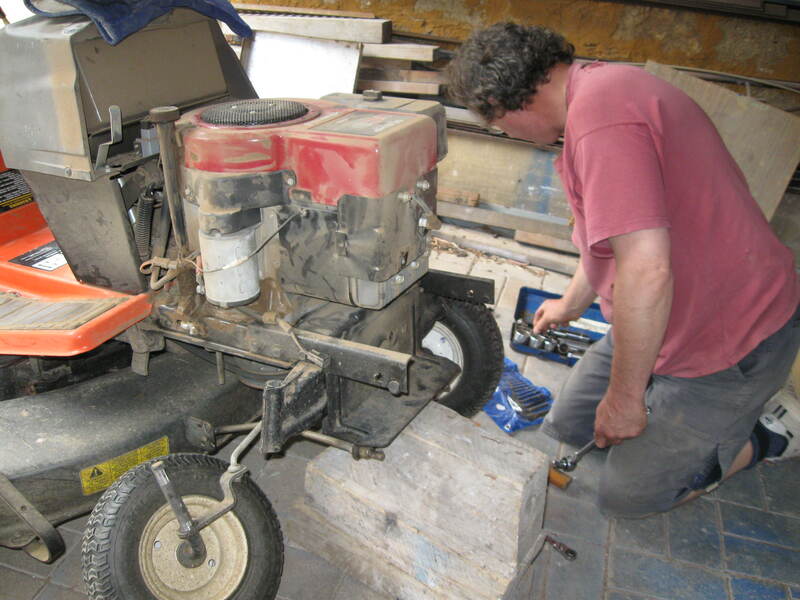 25 years later, that new mower is now the old one and is worn out too, although the motor is still good. See what the years do. I examine the old axle assembly. It’s pretty much had it, all torn asunder with metal fatigue and stress. I can imagine what my arteries might look like after all these years? I decide that the best thing is to start again and build a new one from scratch. Not a new mower, but just a new front axle. I jack up the mower and take it to bits. Once stripped down of all it’s plastic bling, it doesn’t look too flash. Maybe I should start to wear make-up? It doesn’t appear to be such a big job. I have a small length of thick walled steam pipe and I cut a couple of panels out of 3mm steel plate on the guillo. The jobs almost done! I measure the angles, make the final cuts. I need to get the camber, cast and rake correct, and it has to be able to swivel to allow for uneven ground. I plasma cut the necessary holes in all the right places and weld it all together. A coat of primer and it’s ready to go. As good as new — if not better. I can’t tell you how satisfying it is to restore something vaguely complicated back to working order and forestall waste and save expense like this. I don’t like throwing anything away until it is really worn out. I think that this mower now has another decade of life in it yet. And it was all made out of bits of scrap, that others may have thrown out. I guess that this is not so much maintenance as rebuilding. 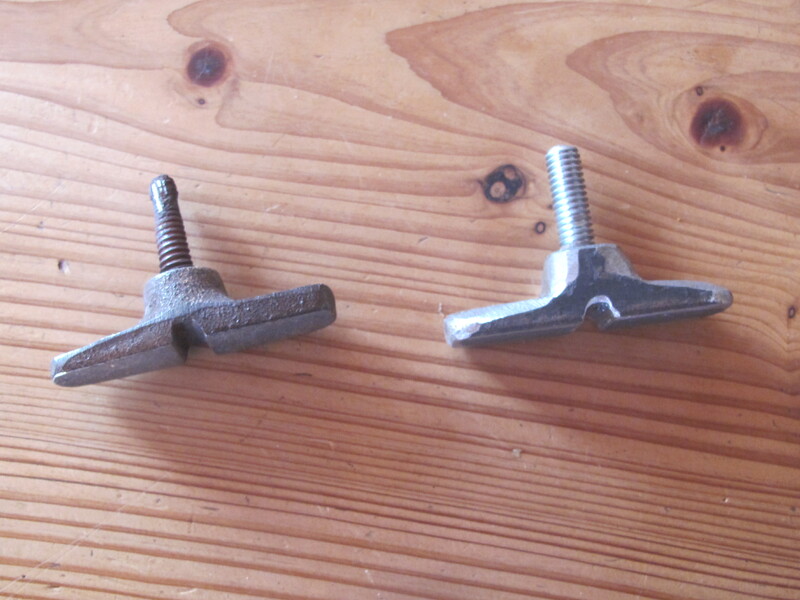 Because things come in threes, the kitchen stove firebox door catch finally gives up the ghost after 35 years. We bought this slow combustion stove 2nd hand in about 1977. It was out of date when we bought it and there were no spare parts to be had then, never mind now. It has given good service when you consider that we light it almost every day of the year, at least 300 days a year. It cooks our meals, heats our hot water and keeps us and the kitchen warm on cold nights. It’s lovely to come inside on a cold evening after working outside all day, in to a warm house and snuggle up to a hot stove. The only days that we don’t light it is in the heat of summer, when we already have enough solar hot water and lighting up the stove will heat the room too much for comfort. Now after infinitesimal turns of the screw, it has completely worn the threads off the shaft of the catch, to the point that it won’t catch anymore. If the firebox door can’t be reliably kept closed, we can’t risk burning wood in it at high temperature in a timber floored kitchen. It’s not a big deal, but I know that I can’t buy one to replace it. We have been making our own specially shaped firebricks to replace the ones that wear out in the firebox for years now. In fact the ones that we make ourselves last much longer than the original ones. I use my good kaolin clay and hard fired high alumina grog from my recycled wadding to make them and fire them in the wood kiln. They turn out remarkably well and last forever. Rather than try to fix the old worn out firebox door catch, I decide to keep it as a pattern and cut a new one out of a block of steel bar. 35 years is a lot of catching and locking. They don’t make appliances like that any more. I spent an hour making the new one to replace it. Cutting out the basic shape and filing it to a nice finish, then tapping a new thread into it. It looks good and works well. The old one was cast, this new one is fabricated. No firebox door catch — no dinner! Necessity being the mother. I invent this new one. 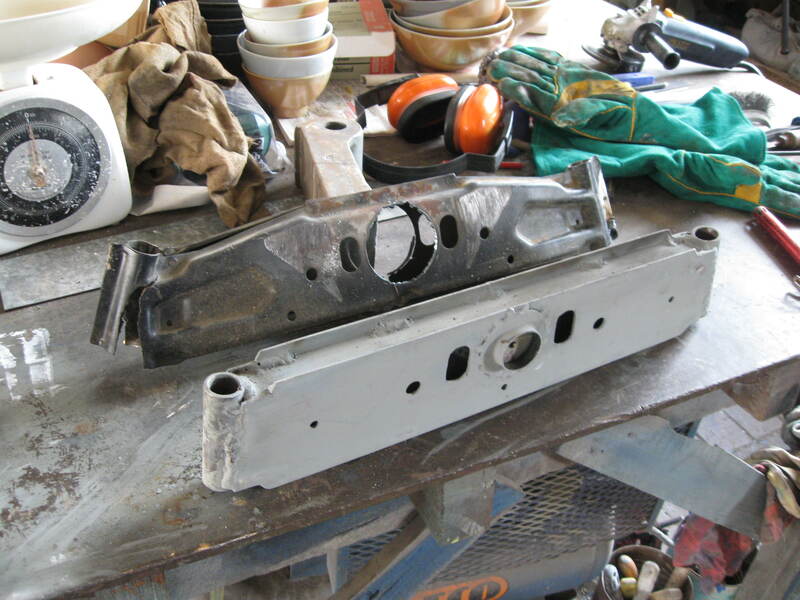 More waste forestalled by recycling old metal scrap. Friends of ours recently bought a new kitchen stove like this one. It cost them somewhere around $13,000 + installation costs! We couldn’t afford to live here if we had to pay for everything. In this case, there’s a catch to living simply. These repairs aren’t perfect, maintenance is never finished, nothing lasts. It’s always good to be home. We arrive home to some shocking news and most of it is all bad. There was an election while we were away and one of the two impossibly bad choices won! No surprises there. The water pump has burnt out apparently and won’t go. However, it’s only the thermal overload and I soon have it going again. A visitor in our absence has snapped off the front door key. It’s one of those very old rim locks, about 100 years old, or more. I found it 2nd hand in the 70’s when we were building the house and restored it back into working order, it fitted the huge old door that I found dumped in condom ally in Darlinghurst. I could tell from its thickness and size that this door was very old and worth taking home to work on. Even though it was covered in masonite cladding, I could still tell. When I got it home I prized off the masonite and plywood cladding that had been nailed to either side. It revealed a beautiful redwood door, with a beautiful opening in the top half for a sheet of glass. I measured it up and built the space off the verandah to suit it. The old lock fitted perfectly in the existing holes in the wood. I had collected about 30 of these old rim locks, all buggered and broken in some way. They were around in junk shops in the 70’s. I managed to get a lock to fit almost every door in the house. Of course non of them had keys. I became quite adept at filing down dye-cast blanks to fit and get them working again. In those days, I could buy the dye cast blanks at the hard ware shop for a couple of dollars. Not any more. We don’t have any hardware shops anymore, only Bunnings and Masters. The ‘blister-pack’ specialists. The last time that I needed a key blank for an old lock. I had to go to the locksmiths in Bowral. The smug barsted said.”Oh they are very rare, it’ll cost you $50″. He thinks that he has me over a barrel, that I’m at his mercy and he can charge whatever he likes. It’s a kind of blackmail and I don’t like it. I know that these blanks are only die-cast rubbish, probably made in India now and are only worth a few dollars. Needless to say I declined his generous offer. This time I decide that if I could make a blank fit in the seventies, then I can make the whole key now. I set to work. Turning an old piece of rusty steel bar on the lathe down to size, and making a little bit of decoration on it along the way. Then I make a clock-work-like hand piece for it out of rusty 3mm. plate and silver solder it on into a groove I cut into the shaft. I use 50% silver/copper solder. It flows into all the cracks easily and polishes up to a nice golden colour when brushed. Then finally I weld on a tang to shift the internals of the lock mechanism out of 3mm plate and TIG weld it, fusing it into the shaft. Lastly I cut, drill and file out the spaces deeded to fit the mechanism exactly. It takes a little time but by the afternoon the lock is back on the door and the new hand made key is a better fit than the last one and will outlast me and the lock. It’s a beautiful thing and I’m proud of it. Not least because it actually works, but because it is made from scrap, here on-site, without the need for a smug overpriced Bowral locksmith. 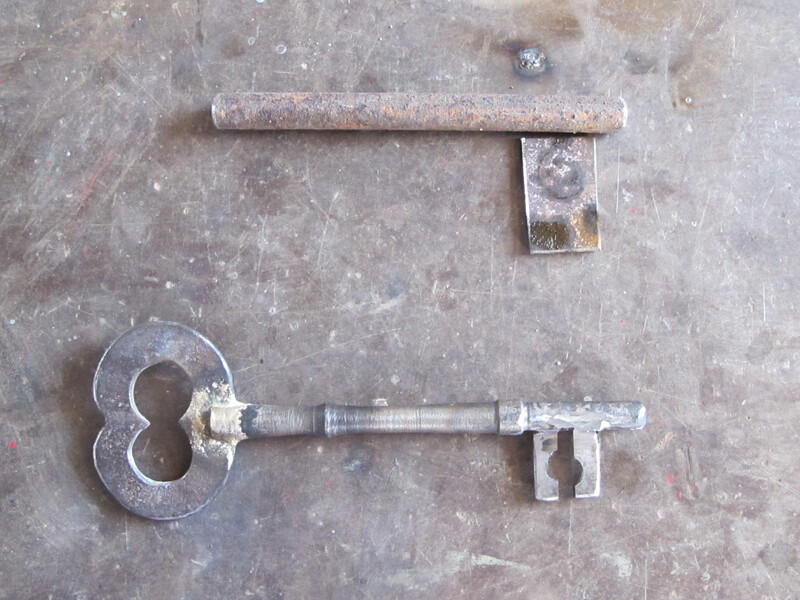 It’s a handmade key for the door of a hand made house. It’s proper and fitting. In every way. It’s the sweetest thing, to be self-reliant like this. The next drama is when I open the mail to find that someone has hacked our credit card in our absence and I have to ring the bank right away. We took the credit card with us on our trip, but didn’t use it. I kept in my body wallet with my pass port just in case it was needed. We took some cash with us to get started, and worked and earned money along the way. The card has been cancelled and will be replaced There will be no cost to us. It will take a week for the new cards to arrive. I can live without a credit card. It doesn’t get used that much, but sometimes, you just have to have one, like when we rent a car. It is used as the guarantee of payment. I have to go through all the places that are linked to it for online automated payments. The internet access bill, the phone bill, the highway toll tag auto payment. There aren’t that many, but it takes the rest of the day. Finally, I go to the vegetable garden to find that the 3 garlic crops have been struck with an orange rust like disease and there won’t be very much garlic this year if any. We’ll have to pull it all out and burn the leaves. There isn’t any treatment or cure. We will have to find a new place to grow garlic for a few years. So what were the highlights of our trip? I liked Venice, but will have to go back in a different time of year. 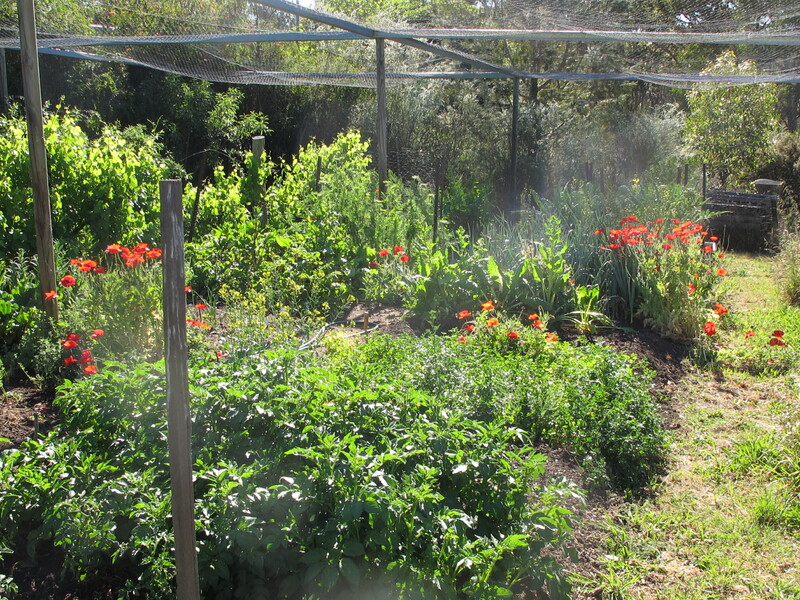 I loved looking into peoples gardens, orchards and vegetable plots. I loved all the ancient stonework. The little villages and hamlets. The vineyards clinging to the sides of steep hills. 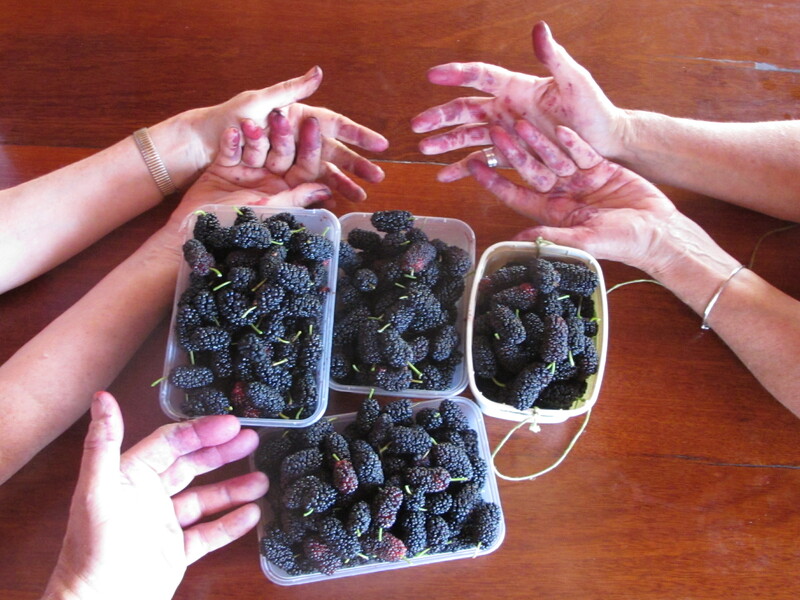 I particularly liked being a ‘gleaner’ for a day. In Dessau I really liked the minimalist Bauhaus museum with almost nothing in it. The highlight of this museum was to see a line of Mies Van Der Chairs all in a Rohe. But I think that the real highlight was the visit to the Big Budda. Going up in the lift to floor 7 1/2, and then crawling along the passage to look out through the buddas eyes and seeing the world like he did. The temperal-spatial portal into his world. It was a real “Being Gautama Malkovich” experience. The world will never be the same again. Elvis has left the burning! We are home to this dry hot weather for four days now and it’s really windy as well. This is the sort of weather that we would expect in summer, but not in spring! The hot dry westerly winds bring grass pollen which makes my eyes itch. It’s a month early for hay fever, but this is the new reality. Global warming! You can deny all you like, but you can’t fool nature. These hot dry westerly winds also bring small black sticky bush flies that get in your eyes and ears and nose. You just can’t shake them off, they are just so annoying. Suddenly at lunchtime there is a huge pillar of smoke rising just the the north of us. It’s quite alarming in this weather. In this wind. Janine has gone into Bowral for her skin cancer doctor appointment. She has to wait for an hour or more to get in, so is still in the waiting room when the fire erupts. From the size and density of the smoke, I can see that this is bad, very bad. I start by filling the firefighting pumps with petrol and giving them a test run. They all work perfectly. Next, I’m up the ladder cleaning out the gutters. We haven’t been here for two months, so they’re all pretty clogged up. We usually keep them spotless, as we rely on them for our drinking water collection. But we just haven’t been here. The bush fire disaster today was quite bad and there may have been one house lost in our village as well as part of Sandy Lockwoods pottery. We are both OK, as is Sandy. She was here with us this afternoon. Apparently, the fire started in our village when a tree fell in the strong winds and brought down power lines, which started the fire. We don’t know if this is true or anything else as yet, as we are still under lock-down. 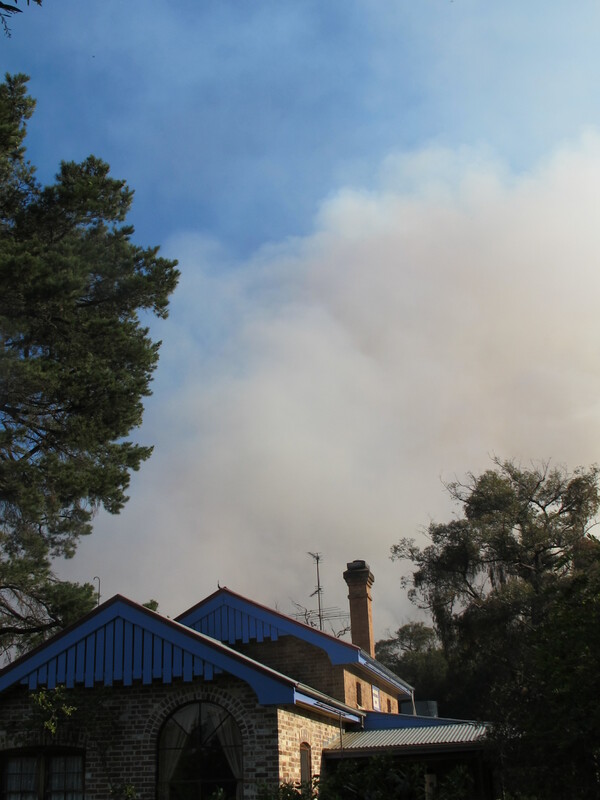 Luckily for us, the fire passed us by, about 400 metres to our north and crossed the road from west to east, pushed by the strong westerly winds. It has kept going and has closed the Hume Hwy. Our road is now open, but all the Hume Hwy traffic is now passing our door as the hwy has been re-routed. All our safety systems worked perfectly. All three independent fire fighting petrol pump systems worked. Started first go, and were in perfect working order. Just as I had prepared them, before leaving for OS. Almost 40 years of preparation for this moment. All the wall sprinklers, roof sprinklers and set hoses, all in order. I run the the pumps dry and always leave them drained of fuel over the winter so that the carburetor won’t ‘gum’ up as the fuel ages and cause the engine to fail. After filling the fuel tanks, the engines start first go. I test all the systems. We have three different independent, petrol engined fire fighting pumps. One for the roof and wall sprinklers on the house, which pumps drinking water onto the roof and collects it again in the water tank from the gutters. This has to be clean water for drinking. No dam water up there on the roof. Two other petrol pumps run other systems on the other roofs of the pottery, the kiln shed and the barn. The big petrol pump is on the dam and pressurises the kilometer of underground poly pipe that encircles our land. It runs all the hoses. As we had been away overseas for the past 2 months, the gutters were pretty full, but were soon cleared. We soon had one, then two, then three helicopters with water bombing capacity overhead and later ELVIS’ the really big snorkeled, helicopter, water bomber arrived. This saved a lot of houses from destruction. All but one of these amazing pieces of technology disappeared in the late afternoon, as soon as the pressing danger had moved to Bargo, where they were needed more. It’s a credit to all involved and to the state government for the funding to allow all this technology to happen. Even though they are right wing and deniers of climate change or increased global temperatures. This is very early in the year for such hot windy weather. Even so, all is well now until tomorrow afternoon, when the temperature increases, the humidity falls and the wind picks up again. Or the next day when the conditions align and we face it all over again. Only a good rain will put this to an end. We briefly went for a walk down the street just now to look at the street in the dark. There are glowing stumps and “roman candle’ trees still burning in the strong breeze. These will be the sources of sparks tomorrow when the wind picks up again. In the blackness, they look quite pretty as we walk. 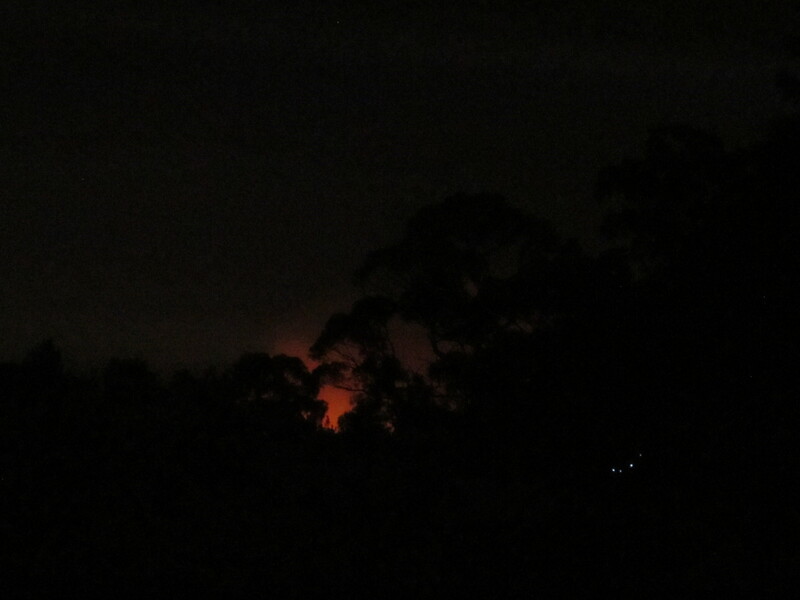 The dark sky is illuminated by the strong pink glow of the fires still burning. I will have to get out of here briefly tomorrow to re-fill the two petrol containers, as we left them with a minimum of petrol in them for safety reasons while we were away. Thanks again for your kind thoughts, all of you who wrote, called, texted or emailed us. We were just so very lucky today. It all could have been very different if we lived 400 metres away. It’s a cool day today – The day after. What a relief. Time to take stock and to recover. The sky is completely full of smoke, we can’t see very far at all. The smoke is everywhere. The smell of smoke is all through the house. My pillow smells of smoke! The sun is a dull orange glow without distinction through the smoke and the light is orange/yellow as it struggles through the thick haze. The sky is full of noise again now. 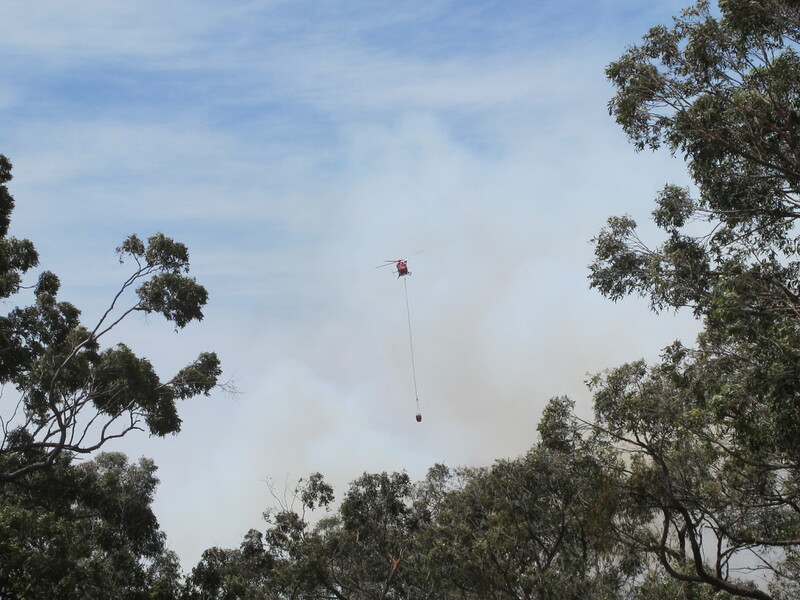 The helicopters are back early to keep the fire under control and stop it getting away again. They worked into the dark with lights on last night. The noise is loud and persistent, we can’t see them now, but we know that they are very close, almost directly overhead, but the smoke is thick. The helicopters appear in and out of the smoke as they pass. They have drained all the available dams in the village and are now working dams at a greater distance. It’s a regular 4 minute cycle as they pass over in each direction. I know when ELVIS flys over, because the windows rattle and the air pulses with the impact of the air pressure from the rotors as they pulse past. It’s a huge machine. There must be enormous pressure on those rotors as it lifts off with 10 tonnes of water in its belly. Eventually, in the afternoon Elvis goes and everything is a lot quieter. 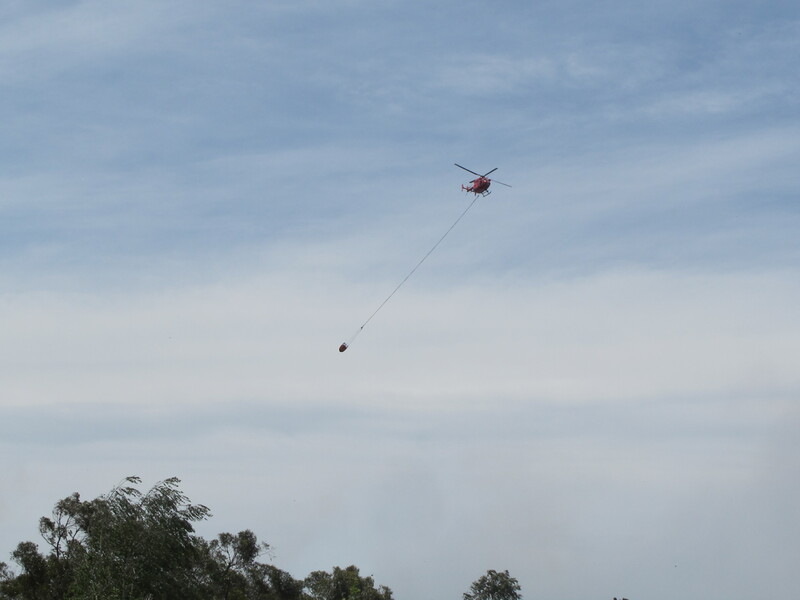 but the other smaller helicopters are still moving about in the area, in the smoke, occasionally flying directly overhead with their water buckets dangling behind. It’s a much cooler day, even turns cold in the afternoon. 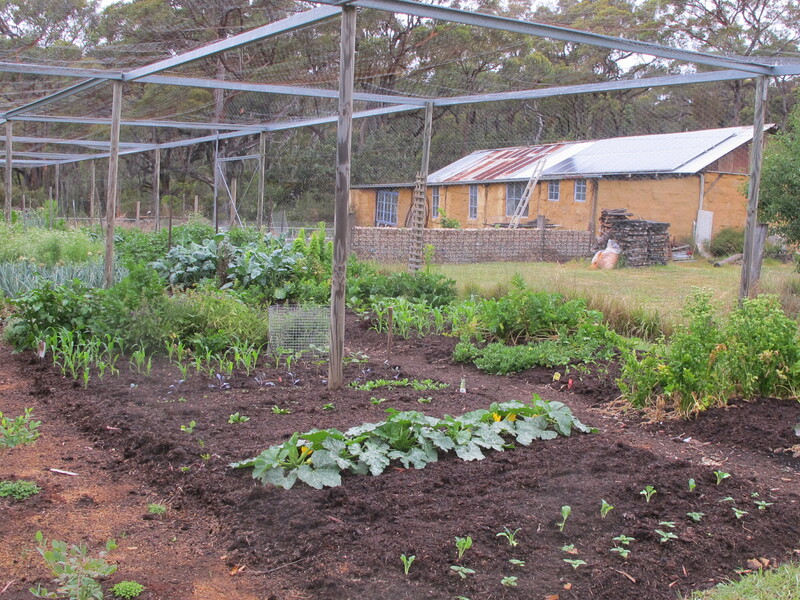 I spend the afternoon in the vegetable garden, trying to plant out some vegetables seeds and seedlings, so that we will have some food to eat in the summer. Life must go on. Finally it’s getting dark. The helicopters have finally gone and it’s quiet. time to go inside and cook some dinner. The night glow through the trees! We are stumbling about in the smoke, trying to live our lives as normally as possible, It’s like we are in a scene from Apocalypse Now. I’m no Captain Killgore, but the scene is similar. The helicopters are over-head, mostly we can’t see them, but they swoop by, in and out of the smoke. The real difference being that in these circumstances, I hate the smell of wood smoke in the morning! Our friend lost the corner of one shed, so very lucky outcome, seeing that they are so far out into the bush. The winds have turned and are coming in from the coast, so much cooler and a little bit of humidity in them to keep things settled. The helicopters are still working hard today to try and get as much hazard protection done as possible before the next really hot westerly winds return on Monday. There is a fire to the west of us in the Blue Mountains that could zoom over here quick smart if we are unlucky. It all depends on the hot westerly winds that are due back for the first half of next week. Monday, I thought that I’d given up smoking? It was a still, quiet day yesterday. We wake to a calm smoke filled cooler day. The forecast hasn’t turned out to be as bad as they were predicting. It’s not going to be catastrophic today. The wind is only a breeze and it is coming in from the North east. This means that it is cooler and full of humidity from the coast. There will be no raging fire today. At least not while the breeze stays in this direction. The weather forecast changes regularly, so we have to keep an eye on the web site. It may be different this afternoon when the temperature rises and the humidity falls. We can only wait. What is happening is that the northeasterly breeze has brought all the smoke back to us from the fire that has passed us by heading for the coast? When I wake I can smell the smoke in our bedroom, but it’s not until I put my glasses on that I can see that the shaft of light coming in from between the curtains is actually white with the smoke. No wonder my throat is dry and a bit raw. We have done as much as we can to prepare. We can only wait now. Janine has gone to Sydney for the day to finalise her sister Jenny’s probate matters with Jenny’s daughter Jane. I’m here with my friend Len Smith. I’m welding a kiln for him today. It’s nice to have someone else here with me — just in case. Here are some pictures of our neighbours place just a few hundred metres away on the other side of the road. We will wait to see what happens here today. I think that we are well prepared, as well prepared as we can be. but there is alway more to do to get it better. Today we discovered a short length of polythene water pipe still above ground and covered in grass. I’d completely forgotten about it for a few years since we had to repair the line after a bobcat accidentally dug it up. It’s fixed now and all burried underground again. It appears that it might be all over for the fires here for us for the time being. Our bad fires come from the West, blown by strong, hot, westerly winds. There isn’t any threat out to the West of us at this stage. So we are clear now, for the time being. Last week’s extreme fire day came and went without any new out-breaks here. There was just one helicopter with water bucket intermittently working the gully behind us these last few days to make sure that all the stumps and other glowing embers were not driving showers of sparks into new un-burnt territory. As the fire started here in this village, it has been driven a long way to the East by the strong westerly winds, and so far there is no new fire to our Western side of us to cause us concern. However it is very early in the spring/summer for bad fires. I wonder what it will be like in December/January, when it really gets hot and dry? We were busy whipper snipping around the fire pumps and discovered a short length of poly-pipe that wasn’t buried. It had been dug-up and damaged by the bob-cat when we had some work done a few years ago. I quickly repaired it with a new section of pipe, but never got around to reburying it. It wasn’t summer and there was no bushfire threat at that time, so I forgot, or it just slipped out of mind and off my ‘to-do’ list. Grass had since grown over it and covered it in amongst the bushes that regrew. Needless to say I was horrified when I started to clear around the pump house and discovered our vulnerability. By lunch time I had dug a new trench with a mattock and had it all buried again safely underground. Since 1975 I have buried about one kilometre of poly-pipe underground around our block. Nearly all of it done with a mattock and spade. Just 6 to 10 metres per day, early each morning, was my usual schedule, early in the morning before it got too hot. I did it all by hand to save money in those early days. I must have been crazy! It was because we had chosen to be independent potters. To not take full time jobs and to try and make it on our own – independently. We just never had any spare cash. Because we were young, just 21 and 23 when we bought the place, we couldn’t get any finance from the banks and had to go to money lenders. This meant that we had to pay 23% interest on our home loan. It was crippling, but we did it by working very hard and being frugal. We now have a ring of 50mm dia. (2”), high pressure polypipe that goes all around the perimeter of our block, with 25mm branches leading off from it to every useful point on the block. In front of, or to the sides of each building and to each orchard and every garden plot. There isn’t any point in the garden now that isn’t within a 30 metre hose length of a tap. I spent the afternoon installing four more roof sprinklers. One on the western edge of the pottery roof and one on the Western wall of the kiln shed. Then two on the western edge of the barn. All these jobs have needed doing for a long time. It needs a severe jolt like this to get me moving. I’m just too lazy or otherwise occupied, to do anything until it really needs to be done. There is always too much to do at any one time. We make lists and then new lists. The lists get longer and some jobs just drop off the bottom of the list and never get done, replaced by new more pressing jobs. I’d like to claim that we are operating on the very modern and efficient ‘Just-in-time’ delivery system, invented by Toyota. But we’re not at all efficient. We just lurch from crisis to crisis. Even with all this drama I have managed to find time to plant out a few more vegetables and water what is already planted out. With all the hot dry westerly winds, the garden dries out within a few hours, things are starting to wilt by the afternoon. We are so busy with all this fire protection, that sometimes the garden doesn’t get watered until it is dark and dinner is even later. We seem to be entering a Spanish dining timetable. 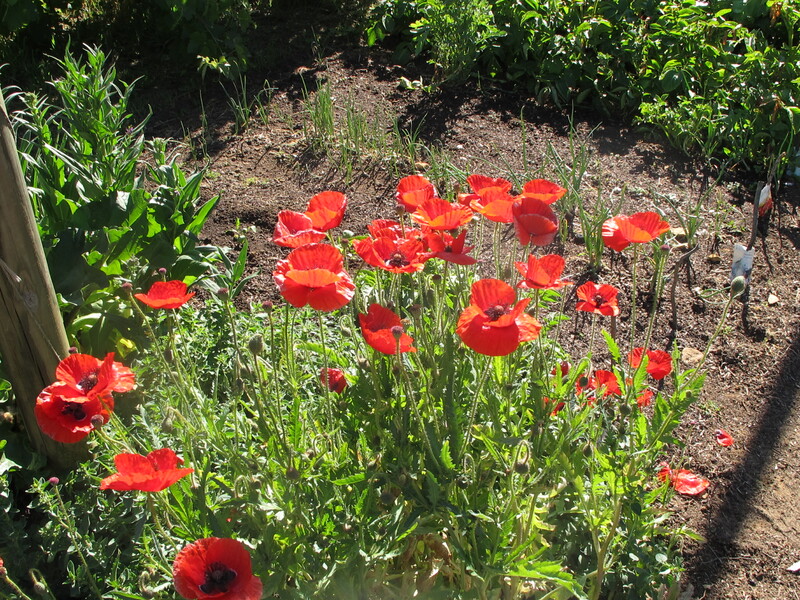 The hot dry weather suits the poppies. They are doing really well in amongst the vegetables. Many years ago, in the 70’s, when Janine and I first went to visit the potter Col Levy at Bowen Mountain, we saw that Col had been breaking up his rejects and filling holes in his driveway with the sherds. I was longing to stop and steal a piece of copper red or shino, but I was young and well mannered, so I didn’t. I’ve regretted it ever since! Well, that was then and this is now. These days I never miss a chance to steal a shard from a drive way, a gutter, a stream or a path — where ever I find them. When I was in New Guinea I visited a beach where potters had launched their trade canoes to take their pots across the bight to swap them for sago, when the trade winds reversed they sailed back with their cargo of food. They must have been doing this for thousands of years, because the beach was almost entirely composed of terra cotta sherds. They must have dropped a pot every now and then when loading the canoes and over thousands of years one pot after another the number of lost pots was enough to create a ceramic beach of polished smooth, orange terra cotta. I know that I should leave nothing but foot prints and take nothing but photos, but I couldn’t help myself, I wasn’t prepared to suffer the angst of loss that I experienced by being ‘good’ at Col’s place all over again. So I have a small piece of ancient New Guinean terra cotta. 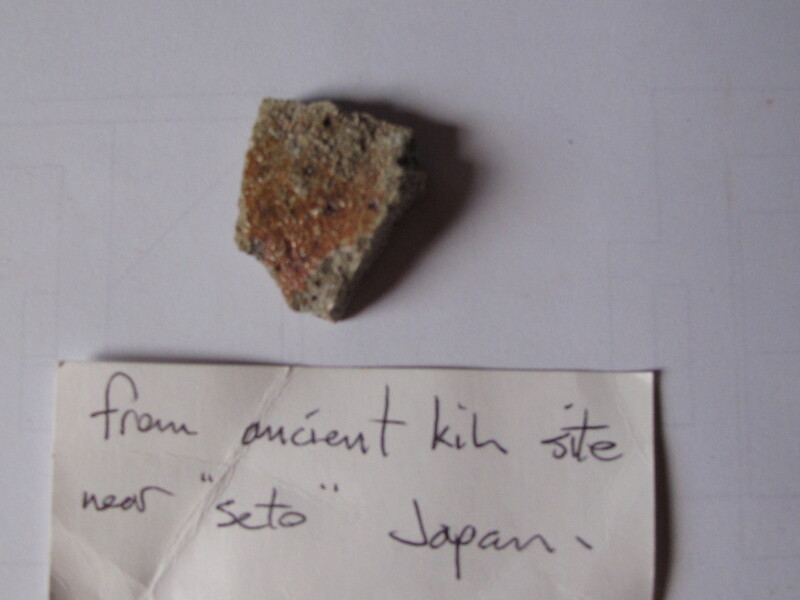 The next sherd that I stole came from a stream near the village of Imbe in Japan in the 80’s. 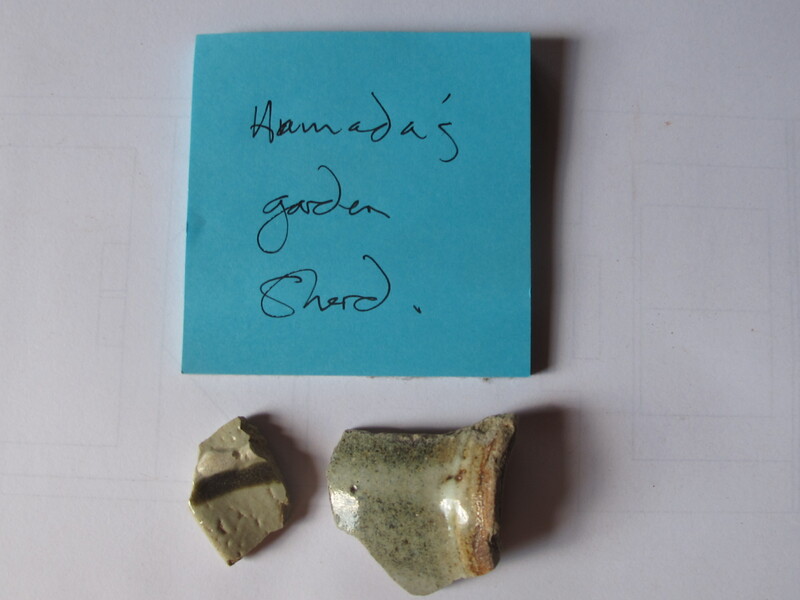 I found some ancient Bizen sherds that had washed down the hill from an old ceramic site somewhere up in the hills. I followed the creek up and up, occasionally finding little pieces of ceramic in the water, until they seemed to run out. I knew then that the old kiln site must be somewhere near by. I rummaged around in the forest on either side of the creek in the general area and eventually stumbled onto the old tunnel kiln trench. The arch was all gone, but the glazed soil of the floor and walls were still intact. I took nothing from this site, as I thought of it as a place of archaeological interest, where placement and stratification are all important. A few years ago, on a subsequent trip to Japan, we visited an old preserved ‘Seto’ kiln site from the 1600’s. I went for a walk down the hill from the site in the scrub and found a small creek in the bottom of the gully. 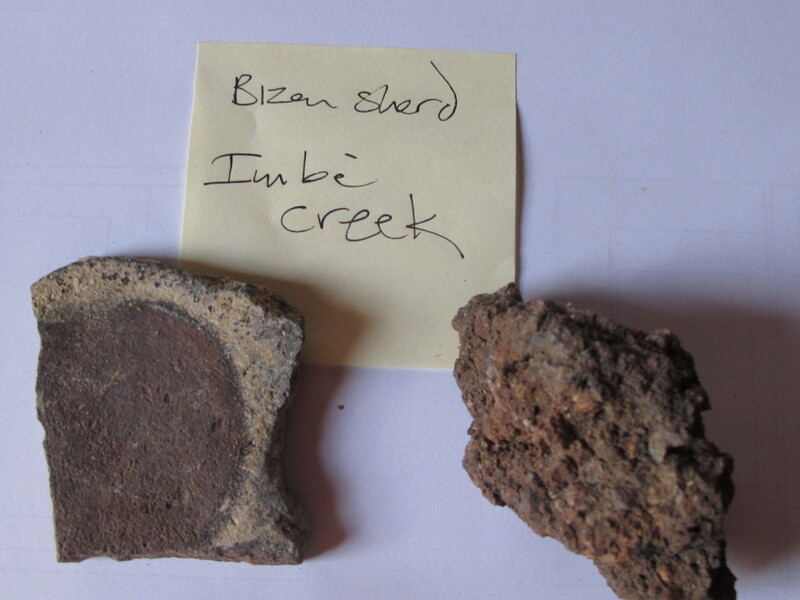 In the bottom of the creek were some sherds, exposed from a sherd midden and in the bottom of the midden, there were some pretty little pieces of wood ash glazed fragments. I presume that they were from that old site farther up the hill, but I don’t know. Later, when we visited Hamad’s compound in Mashiko, we were looking around the old kiln sheds at the kilns. It was raining and I saw that where the roof gutter washed down the garden past the kiln in a little drain, there was a glint of sunlight on something shiny and there were several pieces of broken pot that had been washed down the drain and into the garden soil. I couldn’t help myself. I picked them up and gave them a little rinse under the drizzle coming from the roof. I kept the nicest piece for my collection. A little piece of HamadaWare. Of course I can’t prove that it is Hamada’s. He didn’t sign anything did he? It’s a good sign that I have some imagination. 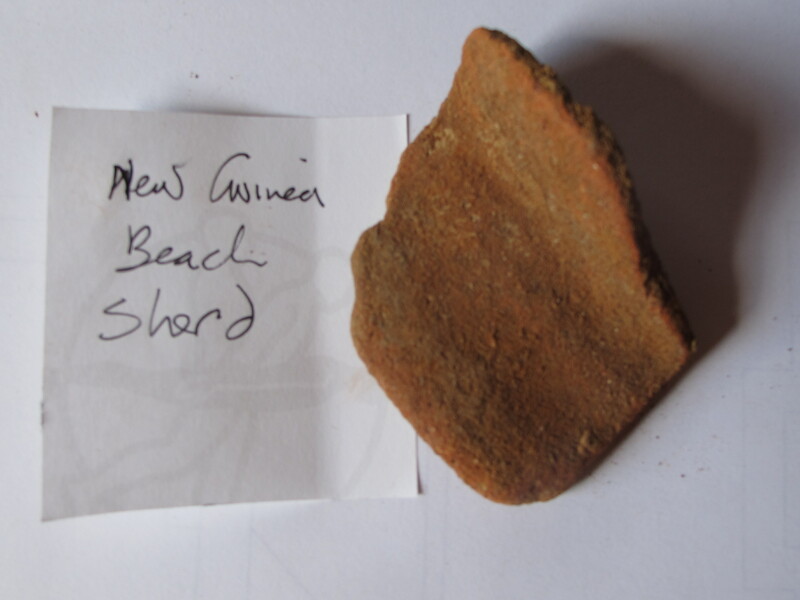 Some years ago at Sturt Pottery when they were excavating into the bank behind the pottery for the footings of the new wood kiln we came across a sherd pile from the time of Les Blakeborough. I could tell the period from the style and decoration of the pieces. I have a little piece of tenmoku now from that encounter. When we were in the UK we went to the Leach Pottery in St Ives. I had read that in the early days of the Leach pottery, they smashed their rejects in the creek that ran behind the pottery. Later, when we were down in St Ives at the bay, our friend Joanie, who was showing us around, pointed out the drain pipe that is now the exit point of the Stennack stream that flows down from the pottery. We searched around in the shingle and found a few fragments of broken and weathered pottery in the gravel that had washed out of the creek. Who knows where they came from, but maybe one of them was from the Leach pottery? In Shigaraki, one of the potteries had ball milled a lot of broken pieces of their reject work until it was smooth and polished. 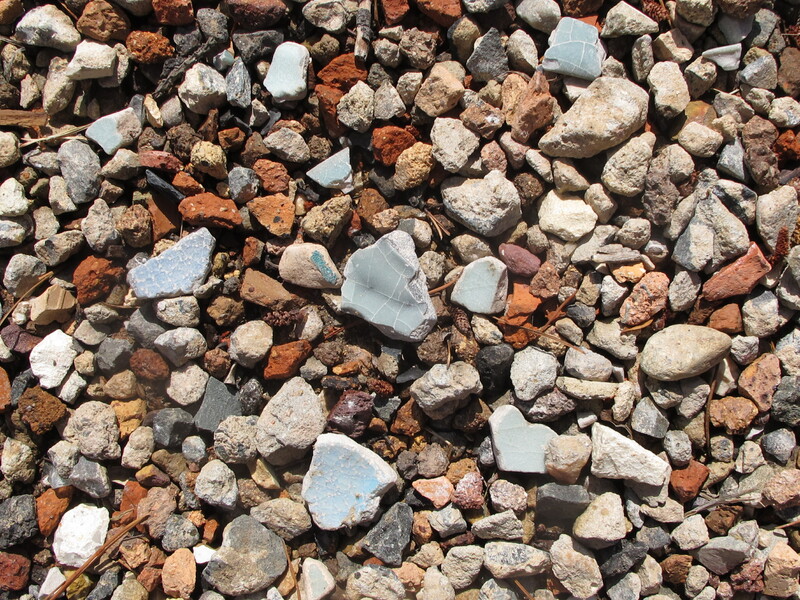 They used it as a polished sherd gravel path down to the showroom. I loved it. I thought of how I have been following Col Levy’s example all these years and burying my smashed rejects in the driveway to fill in the holes. Useful, but a waste of potential beauty. So recently I have been ball milling my smashed rejects into polished sherds and spreading them on our ceramic gravel path. They make a colourful addition to the crushed concrete and terra cotta gravel. I thought to my self, that I have the jaw crusher and ball mill standing there being hardly used, sitting idle most of the time, so why not put them to good use? Now I can ease my conscience just a little for all these years of bad behaviour and theft. I now have a ceramic sherd path that my visitors can steal my beautiful sherds from when they visit our pottery. The pottery will be open for the next two weekends in November, 2nd & 3rd, and 9th & 10th. Come along and steal a small piece of our drive way. Then walk away with no regrets or feelings of guilt. The rain has finally come and the reign of terror of raging bush fires are a thing of the past now — for a few weeks at least anyway. However, it will only take a change of the wind blowing in from the West , off the desert for a couple of days and all this dampness will soon evaporate. Two weeks of it and we will be back where we were. We must stay prepared for the heat of summer, December, January and February will be testing if the heat stays on high. We have seen all the hottest records broken. Hottest day in the month on record. Hottest month in the year. Hottest decade in the past centuary. etc. etc. I can’t imagine that anything is going to change in a hurry, however, I’m very pleased to see the garden and trees dripping wet and the landscape slowly turning green. Even though it is only spring time. The lawn out side the kitchen window has turned brown already, now there are hopeful shades of green returning. I’m amazed how relaxing to the eyes, a little bit of greenery is! It’s also very interesting to see how small vegetable seedlings that were only just surviving, even though we were hand watering, sometimes twice a day on the hottest days, now the rain has come, are just jumping out of the ground. I’m told that rain has a lot of dissolved nitrogen in it. It certainly beats dam water and with this rain, the terroir has responded assertively. The thing that gives such relief immediately is the smell of the rain. Everything suddenly smells fresh and sweet after the rain. We check out the rain gauge in the morning and we find that we have had 32 mm. over two days and a night. The dam has had some run off into it and is topped up a bit. This is a great, relief as the dam had got down to half way (Is my dam half full or half empty?) With all the watering, Having a full dam is like having a bank balance. The dam isn’t full, but it’s more than half full now. So that’s very good! I have spent the last 2 weeks making fences, particularly around our young citrus trees, but also in the main stone-fruit orchard. After the fire, there was nothing left in the bush for the wallabies to eat, as all the undergrowth was burn out in the valley. We woke up one morning to find that they had made their way up here, following the gully up out of the ravine and into our backyard. With no green growth to eat, they had come looking for food. 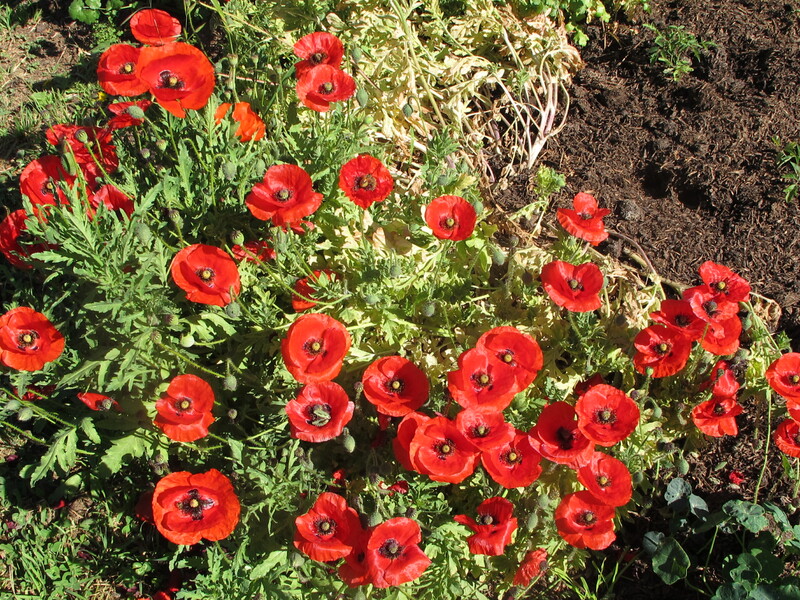 They had made their way into the closest, bushiest, wild part of our garden. They started to eat the tops out of our citrus trees. I had already put low wire mesh rabbit proof guards around them at ground level to stop the rabbits, but the wallabies are much taller. Because there is always so much to do, so many jobs competing for time, the fence around the citrus grove never got built. It was one of those jobs that just dropped off the bottom of the list. We were lucky to be able to get the ground cleared, the stones dug out and the trees planted. That was quite a lot of work, then we had to play catch-up and go back to earning a living. A fence around the young trees never happened! The jobs that go straight to top of the list are the ones where I earn some money, then comes vegetable gardening, potting, followed by building maintenance and so on down the list. Crisis like these, go straight to top priority and out rank all other tasks because of their immediacy. It took a few days for the wallabies to make their way up into the garden. At first there were a few branches nibbled off and I though that this was strange and I wondered at first what was eating them. The next day most of the trees had had a top pruning and then it occurred to me that we had a return of the wallabies. 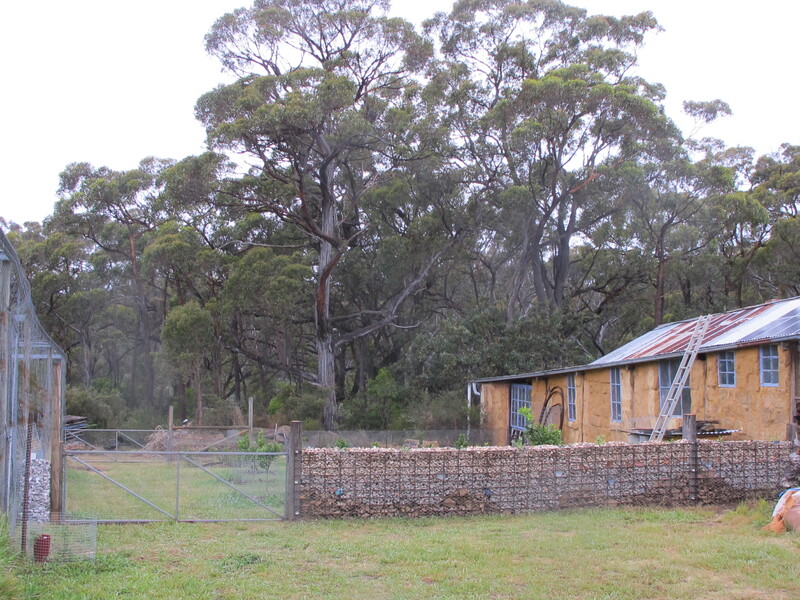 We haven’t had trouble from Wallabies for some years now, because even though we hadn’t fenced off our property, as each block of land that surrounds us was bought and developed, eventually we found ourselves completely encircled by fences. The wallaby that lived behind the pottery eventually decided to move down into the gully where there was more openness and possible mates? Whatever it was, we lost our resident wallaby and no others replaced it, so we got used to not having to fence everything off as we planted it. The only way that wallabies can get to our place now is by coming up the fire trail from the gully. 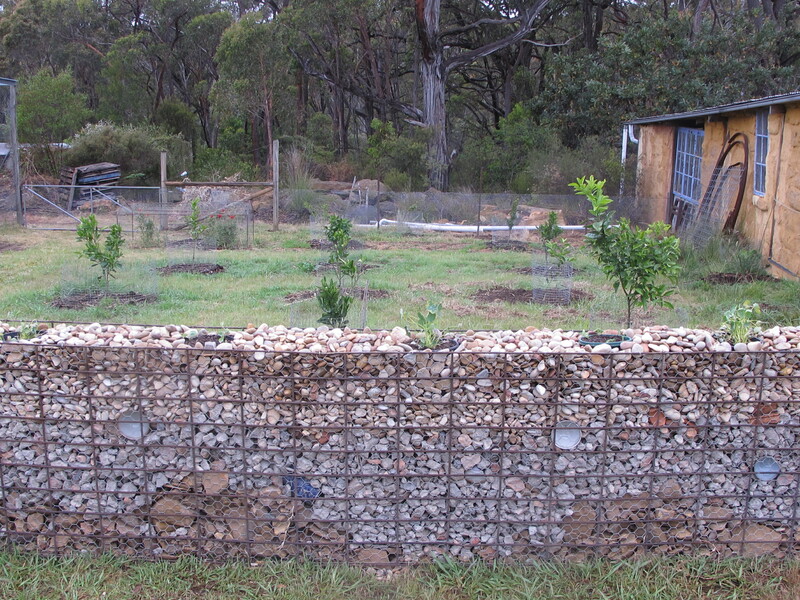 Once I realised what might be the problem, I quickly rolled out a wire mesh fence of old, recycled chicken coop wire, between the citrus trees and the bush, at the bottom of the slope. This temporary fence was held together with bits of old tie wire and supported with re-cycled steel star-pickets, hammered into the hard, dry soil. However, before I could do that I had to split and cut up some big stones that were in the way, in order that the fence could run straight. I decided to use a small 25 mm. square wire mesh as the permanent fence at the bottom to allow the cold air to roll out of the citrus grove during the cold winter months to stop the citrus from excessive chilling and to keep out the little rabbit kittens that can run straight through the chicken wire. For the top fence, I decided to build a ‘gabion’ stone wall at the top, this will be fire proof and rabbit proof, protect the young trees from the worst of the south westerly cold winter winds, hopefully look good and allows me to use up a lot of ‘stuff’ that I have collected over the past few years, as I had in mind to make the front wall along the street out of earth, or stone, or possibly gabion walling. I hadn’t decided, and as I haven’t had the time to do it, no decision had been made. Now as I have this opportunity to experiment with this small, 11 metre long section of new wall, I decide to try a variation of gabion stone walling. 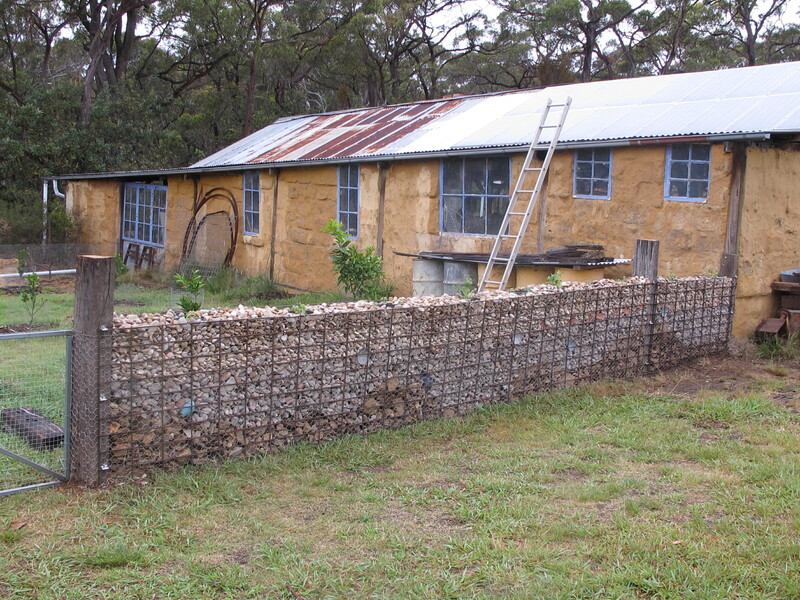 One good reason for choosing to try a gabion wall was that I have a couple of cubic metres of small stones that had been piling up and I was keen to use them for something positive, instead of just back fill behind a dry stone wall. So I was glad to be able to use a lot of these little stones that we had dug out of the soil every-time that we wanted to plant a tree or tried to make a vegetable garden bed. Even now, after all these years, we still dig out half a dozen little ‘golf-ball’ sized stones every-time we re-plant a garden bed. They just keep on piling up and being so small, there isn’t any easy way to use them. In an effort to make the wall look a little bit more interesting, varied and creative, we embedded some pots, seconds and rejects in among the stones and gravel. I like the idea of placing some old, broken, terracotta tiles in among the layers to brighten it up a bit, a nice contrast to a few blue glazed pieces of sherd and pot. I also liked the idea of having things growing out of the top of the wall, so I wanted to incorporate some soil in the very top layer, so that I can grown some nasturtiums in the top of the wall. I think that it will be nice to see them spilling over and trailing down over the wire and stones. 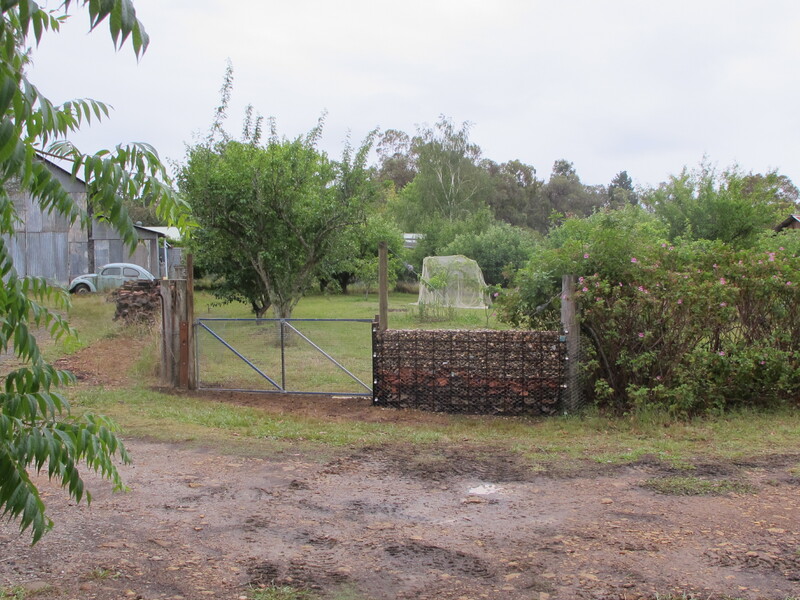 One other job that hadn’t been seen-to for a couple of years now, and had dropped off the list, was to rebuild the gate into the stone fruit orchard. The old blue wooden gate was demolished, a few years ago, when a tree fell on the fence. I made some emergency repairs to the fence, but never quite got around to replacing the gate. With no more wallabies visiting the orchard any more — at least at that time. We got used to not having a gate. However, during the winter, just before we left for Europe, we planted half a dozen new fruit trees to fill spaces where some of the original trees had died of old age after almost 40 years. Now we are back from Europe, we find that rabbits have found it a great space to excavate new burrows and they seem keen to dig out these new small trees. Miss ‘Christo, ‘Running-Fence’ King decides that the whole gate concept needs to be re-thought, even re-located. So the work never ends. 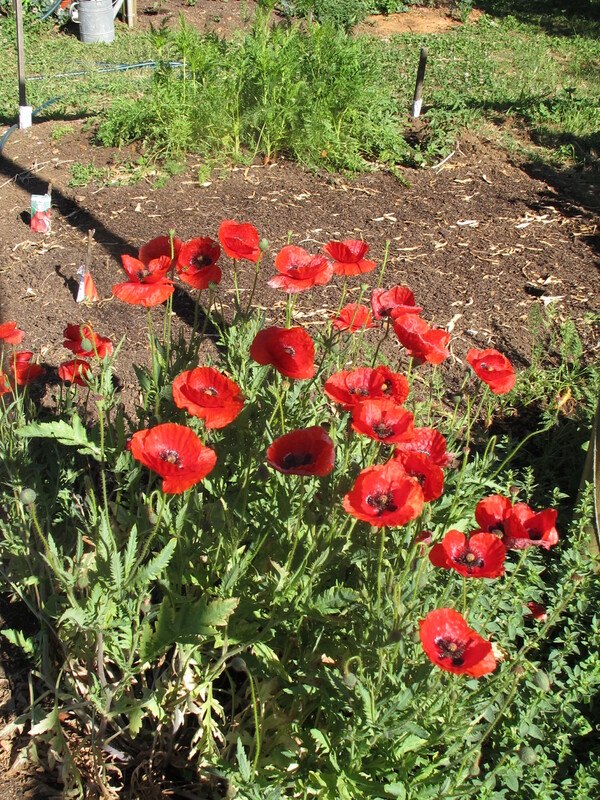 We discuss using a sheet of plain mild steel sheet that I will fold up into a hollow section self-framing gate and I can plasma-cut some ‘negative-space’ relief patterns of poppies into it to add some interest. It will slowly go rusty red/brown colour. It could be nice. I set off to Bowral to buy the steel, but by the time I return, Miss Nina ‘It’s a Woman’s Prerogative’ King has changed her mind — and mine. I will weld up a standard RHS frame gate with ARC weld-mesh and Miss ‘Running-Fence’, ‘It’s a Woman’s Prerogative’, ‘Creative Impulse’ will make some ceramic poppies, glazed in bright colours which she will wire onto the mesh. It’s sounding good, more transparent and brighter than my browned out, dowdy, rusty steel idea. Finally it’s all done, and I would have said dusted, but we have just had another really good pour of rain, so it’s all a bit soggy and so are we, as we were so keen to see the job finished, that we just worked on through the rain and got pretty well soaked too. But it’s all done and it’s all good! And it is good, really good. But my back is telling me that I’ve done too much for the present time, but I don’t live in the present time. I live in the optimistic potential future — where it just might be a bit better if I put the extra effort in now. Time to go inside and open a bottle of cheap New Zealand Sav blank fizz to celebrate, dry out and warm up in front of the fire. It’s hard to believe that when I started this fencing job two weeks ago, it was 39oC and I was desiccated. The ground was so dry that the soil that I pounded out of the ground with the crow-bar, digging the post holes, was so dry that it was just dust. All the way down to 600 mm. deep. I couldn’t pound it back into the holes around the posts, as the dust just floated away. I had to wet it down with a watering-can to be able to get it to stay put. I worked all through the heat of the day, to get the temporary fencing done to protect my young trees. Now, two weeks later, we are wearing jeans and jumpers and sitting in front of the wood fire, it’s 10oC and we have to keep warm. Life is such a roller coaster! I’m a clairvoyant, and what do you do? I am at the fish market and see that filleted salmon frames are only $4. They appear to have a lot of meat still on them, so I decide to give it a try. It’s a big fish, or at least it was. It’s still a long frame. Protein is the most expensive part of any meal for us. Good quality meat or fish costs upwards of $30 per kilo. Of course there are cheaper alternatives, but I refuse to eat sausages. I’m trying to limit my fat and salt intake and stay reasonably healthy, so I want to buy lean meat. Anyway, I only buy red meat once a month and I want to be able to feel good about what I’m eating when I do eat it. Last month it was lamb shanks, cheap, flavoursome and when cooked slowly in red wine and reduced stock, the meat just falls off the bone and is quite delicious. I also buy chicken once a month as well. Some times its the whole bird. ‘The Lovely,’ skins it and boils it and from this she makes a great stock and the meat is separated and used for a number of meals. I’m not religious, so I also buy pork occasionally. Sometimes it’s the belly flap, boiled in our own cider and later, roasted to get that great crackling. This is a once a year treat. At other times I buy minced lean pork and we make gyoza, pork, garlic and vegetable dumplings, in the Japanese style. Sometimes pan fried in our own homemade stock or otherwise steamed. For the most part though, we prefer fish as our major source of protein and we eat it 2 or 3 times a week, two days I fast and the other days we eat vegetarian directly from the vegetable garden, with or without tofu. I’m not a vegetarian, certainly not a vegan. I’m an omnivore, but within limits. For 35 years we kept ducks and chickens. They are such good company and a lot of fun to watch and interact with. We ate them on a regular basis. That is why we kept them. I feel that the only way in which I can justify eating meat is if I kill it myself. Only then do you realise the significance of what you are doing and fully appreciate the meal. I never found it easy. I always had to steal myself for the act. It’s all about living in reality. Taking responsibility for your actions. Being independant and self reliant. I don’t wish harm on any other living thing in general. But I’m not a Buddhist either. I think that if I take responsibility for the meat that I eat then, I’ve earned the meal. One of the cheapest fish at the market here is the local coastal Leather Jacket, usually at or around $5 to $9 per kilo. 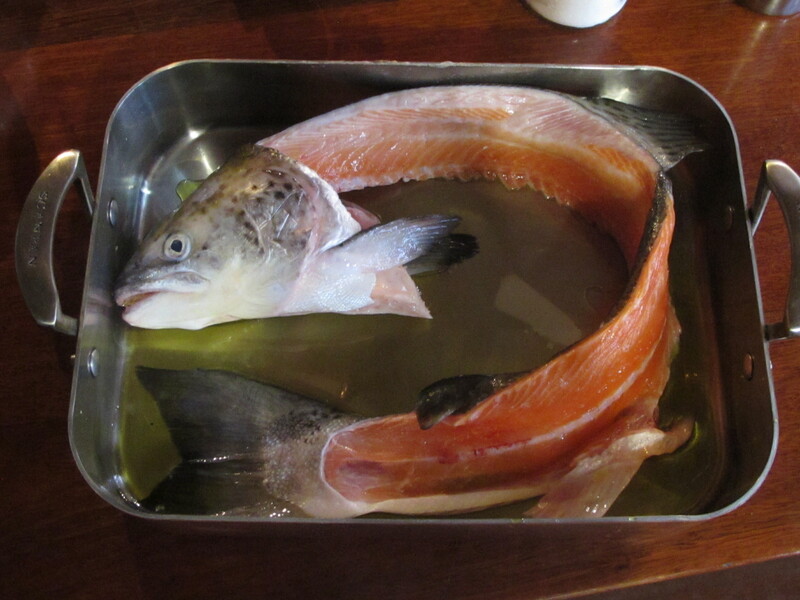 It’s a lovely fish, firm and tasty meat, but it can’t be filleted. It must be cooked whole, so people seem to avoid it. I love it. I have no trouble in steaming it or pan fry/steaming it. I really like it, but you can’t eat it all the time. The small local blackfish are also good value too. Always economical, as the fillets are too small for most peoples taste. I also like to buy sardines or garfish when they are in season and appear in the market. However they only appear intermittently. So tonight it’s going to be ’empty’ salmon bone fish cakes. I simmer the frame for a while, leave it to cool and then separate the meat from the bones. The bones are then returned to the ‘soup’ and boiled again to make a stock. I plan to make fishcakes with our own potatoes and with a hint of wasabe fresh from the garden. 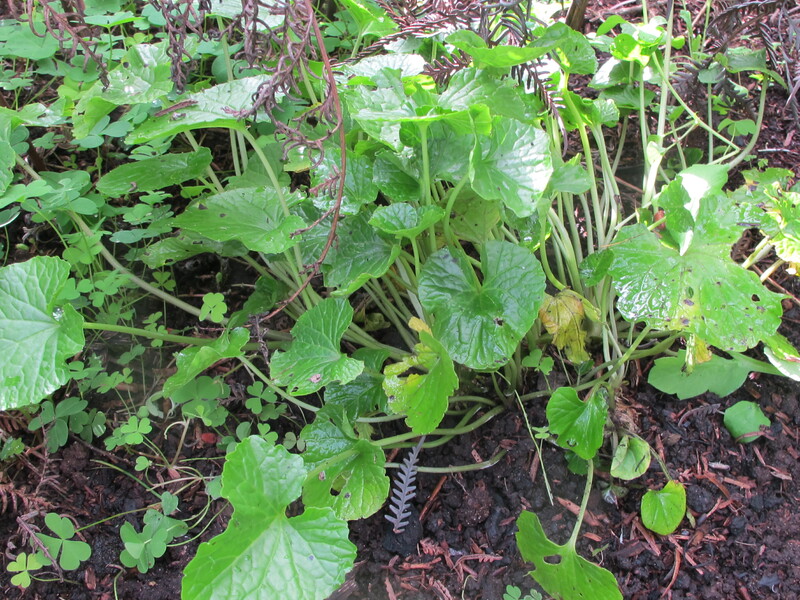 Now wasabe is an interesting vegetable/herb/condiment plant. It is supposed to only grow in the high clear environment of the Japanese mountains, washed by regular misty rain and growing in among the rocks and stones of fast flowing mountain streams, never allowed to dry out, always moist and well watered, growing in the shaded environment of the deep rocky ravines. Here in Australia, there is a small producer in Tasmania, down south in the clear mountain environment where all the stringent conditions of cool dampness prevail. 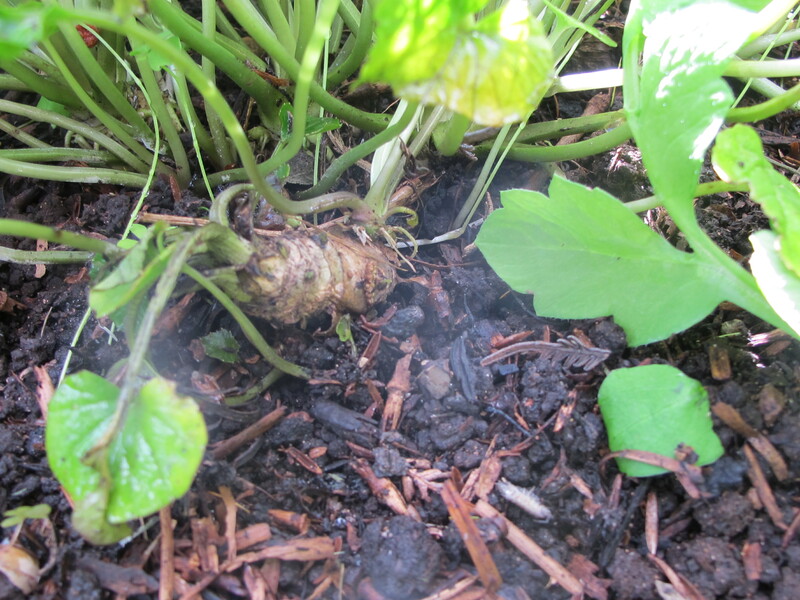 We once saw a small tray of fresh wasabe roots for sale in the green grocers. They had had a power failure and all the fridges and coolers were broken down over the weekend, so everything was on sale or being thrown out. We grabbed the tray of wasabe. Our initial thinking was the grate it up to make our own wasabe paste, and we did do this with part of it, but I thought, why don’t we give it a try in the garden, it’s already sprouting from it’s warm weekend spent wrapped in plastic on the tray. We planted it out in our hot dry exposed summer garden, but we did give it some shade cover, by cutting bracken ferns and sticking them all around to create some dappled shade. We also gave it a disproportionate share of the cloudy dam water from the hose when we were watering. Now three years on we have a small tough little patch of wasabe permanently in the veggie patch. It couldn’t be farther from its home or desired environment, but it lives on, even if it isn’t thriving. 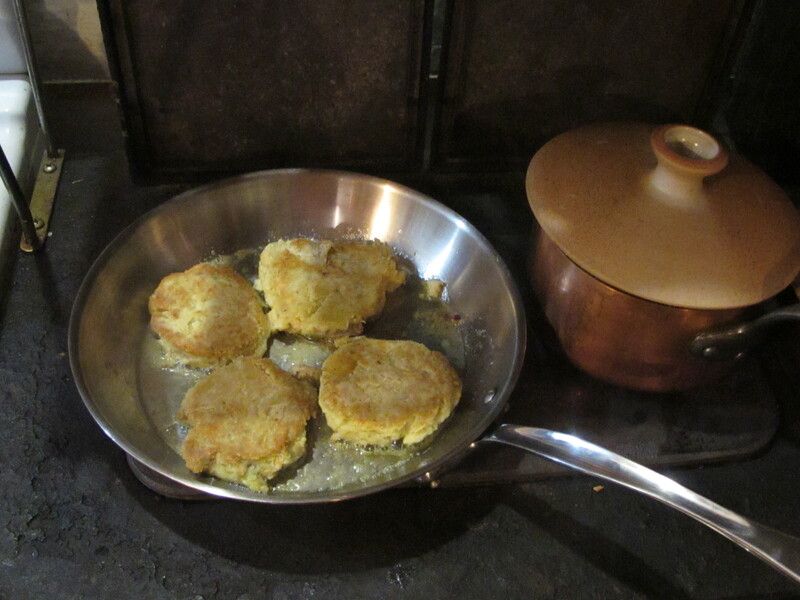 I get to make 10 good sized fish cakes from my efforts. We eat half for dinner leaving some for tomorrow. Served with garden vegetables, they go down a treat. Two main meals and two litres of stock for a risotto another day. All very good value for $4. We have been to a couple of music festivals recently. 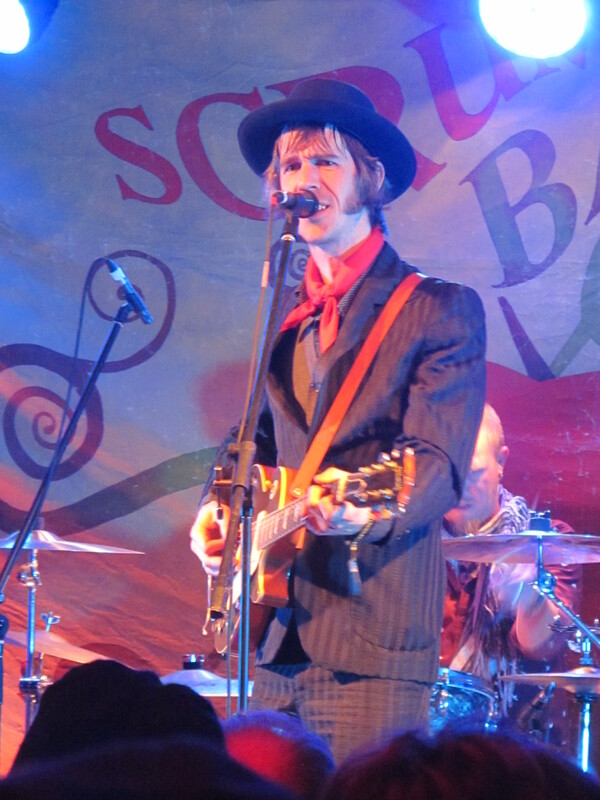 The highlight of the National Folk Festival music for me was Heath Cullen from the South Coast. He is really interesting and very talented. I really like the feel of his music, his style and presence. He’s like the love child of Nick Cave and Paul Kelly – if that were possible? With the breathiness, but sans the basso profondo, of Tom Waits. That sounds like a very strange description, but it is kind of right. I bought both of his CD’s from him. This is really good music for me. It speaks to me. My favourite track is silver wings. I can’t wait to hear some more from him, as he has a new album on the way. At Womad we saw and heard a lot of world music. The act that I liked the most at WOMAD was the Balanescu Quartet, really interesting and engaging. I enjoyed them immensely. I went to see them twice and was really interested and surprised to hear that each performance was different, playing completely separate pieces. I bought both of their CD’s that they had available. I was thinking that I hadn’t heard of this quartet before, however, on inspection of some of my other CD’s when I got home. I thought that there was something a little familiar about their music, I realise that they are playing on the Michael Nyman CD that I have. Romanian virtuoso violinist and composer Alexander Balanescu boldly leads his string quartet across musical frontiers into uncharted territory. Pushing the limits over 25 years has resulted in the world-renowned Quartet collaborating with artists as diverse as Michael Nyman, Ornette Coleman, David Byrne, the Pet Shop Boys, Kate Bush and Kraftwerk. The Balanescu Quartet is an avant-garde string quartet founded in 1987 by Alexander Bălănescu that achieved fame through the release of several complex cover versions of songs by German experimental electronic music band Kraftwerk on their album Possessed. The quartet are mainly notable for their very distinctive style of music, which encompasses odd time rhythms, sound dissonances and complex arrangements. They have performed multiple works with a variety of other artists, including Philip Glass, David Byrne, Gavin Bryars, Michael Nyman, Rabih Abou-Khalil, Kevin Volans, Hector Zazou, Un Drame Musical Instantané, Spiritualized, Yellow Magic Orchestra and the Pet Shop Boys. That didn’t go down too well! What is it that I actually do again?